The first of the units at Stane Leisure Park in Colchester is now open for business. A brand new development for McMullens has opened to great success and is the first restaurant to open in the excitedly awaited Stane Leisure Park. 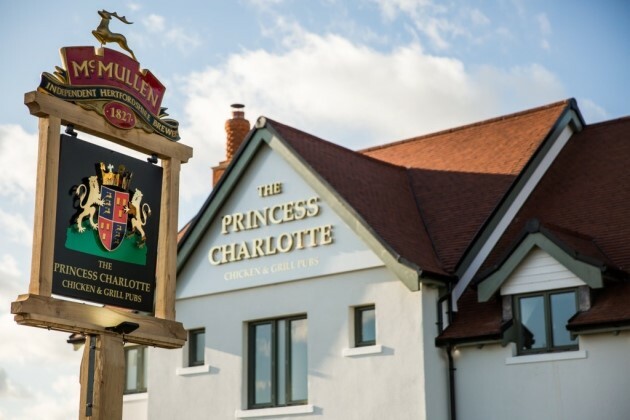 The Princess Charlotte bears the name of The Duke and Duchess of Cambridge’s second child and it is thought to be the first pub in the world to be named after the new princess. Managing director Heydon Mizon said: “We aim to treat every guest like Royalty at the Princess Charlotte and this would of course include the Princess herself. “The pub had been due to open shortly after Princess Charlotte was born, the baby wasn’t at the mercy of a lengthy planning delay and so arrived on time, the pub however was significantly overdue. Stane Leisure Park, currently being built by Churchmanor Estates, also will also include a KFC, Starbucks, Nandos and Bella Italia. The scheme was first proposed back in 2015 and was refused planning permission by Colchester Borough Council, a decision which the developers successfully appealed against. Construction work began in July last year, and the leisure park is due to be fully opened by August this year.